As with last season, we are making these posts available early to allow discussion as soon as the episode is over—the full review will be posted as soon as possible. In the interim, you can check out the rest of The A.V. Club’s Game Of Thrones coverage here. “Dragonstone” begins with unfinished business. Although Arya Stark utilized her training with the Faceless Men in order to murder Walder Frey at the end of last season, he was not the only member of his family who helped orchestrate the Red Wedding. And so in the cold open she poses as the man she killed to orchestrate a larger retribution, punishing the entire Frey family for violating guest right in the murder of Catelyn, Robb, Talisa, and their unborn child. With one celebratory toast of poisoned wine, Arya erases the Freys from the map, and places them into the dustbin of history. But that dustbin had become awfully full at the end of last season. While the show has shown a consistent willingness to kill characters, the end of last season went a step further and wiped entire storylines off the map. In one moment, the High Sparrow and the Faith are creating chaos for Cersei and Queen Margaery alike—a moment later, in an explosion of wildfire, Cersei has no one standing in her way, and Margaery—and the High Sparrow, and King Tommen, and Ser Loras, and Kevan, and Mace Tyrell—is dead and gone. In the North, the Boltons are occupying the Starks until the Battle Of The Bastards, where they are not just soundly defeated but entirely eliminated. It was a striking amount of resolution, almost alarming as a book reader who has watched George R.R. Martin keep adding to the scope of his story with no effort to resolve the existing narratives. Whereas A Song Of Ice And Fire has only grown in scale over time, Game Of Thrones prepared for winter by doing its own form of spring cleaning, emerging as a leaner, more focused show heading into its final 13 episodes. This dissonance is the result of two factors. The first is that Martin’s books are not limited by budgets or season lengths or actor availability, meaning that he can tell whatever story he likes in whatever scale he desires, whereas the show is beholden to those factors. The second is the fact that Martin has yet to get near this stage in the story in his books: despite it now having been six years since A Dance With Dragons’ publication, he has yet to publish another volume. But watching “Dragonstone,” it seems hard to believe that his story will end with such clarity and efficiency as what is currently unfolding in Westeros on Game Of Thrones. While these are still complex characters and there remains plenty of space for intrigue and conflict and betrayal, the fact is that this premiere is designed to map out the final act of this story in the clearest terms possible. This begins as soon as the opening credits—themselves a form of clarity, articulating which locations are currently important with the notable addition of Oldtown—conclude, as the next two sequences take us back to the beginning. As Meera arrives with Bran safely at the wall, we see Bran’s vision of the White Walkers and their army of Wights, marching through the snow. It’s the first image of the new season, if we don’t count Arya’s carryover cold open, and it hearkens back to the very first scene of the series, which was the White Walkers’ attack on the Night’s Watch ranging party. The show began by showing us the greatest threat, but then distracted us with the muddled conflicts of war and rebellion, only to now return to where the story began. It’s a harrowing image, but also a simple one: it literally just reminds us that the White Walkers are marching, and they have giant wights under their command. The episode then cuts to Cersei Lannister, joined by her brother Jaime, for a literal mapping of the season ahead. As an artist paints a map of the Seven Kingdoms on the floor in a small courtyard, Jaime and Cersei walk through the geography of the conflict at hand, much like Stannis did on his table in Dragonstone and much as the show’s own credits do on a weekly basis. Not unlike the gumshoes on Where In The World Is Carmen Sandiego?, Jaime helps Cersei identify key locations, and sketch out what stands in the way of the Lannisters regaining control of the realm. They expect Daenerys to land at Dragonstone in the east; Ellaria Sand leads an uprising to the south in Dorne; Olenna Tyrell masses her forces in The Reach to the west; and Jon and Sansa have retaken Winterfell in the North. It’s blatant exposition, but comes at a time when everyone is taking stock of their situations: the “war” as it were is over, but there is no peace in Westeros, requiring new alliances and preparing for the conflicts to come. These early scenes reinforce that the pace of this season is not going to suddenly go from zero to 60. This is a slow premiere, as far as premieres go, primarily invested in perspective over plot or character development. After the catharsis of Arya’s assault on the Freys, it primarily moves from location to location to show us how fraught this moment of calm is for the characters involved. Everyone knows that they will eventually have to make the first move to survive, but deciding what move is the right one is a different question, and emphasizes that those who have fallen into the dustbin of history have not been fully forgotten. They may be ashes, as Cersei says, but their memories will live on in this story, and inflect the choices made by those left behind. This is especially true for Jon and Sansa, who are at odds over the path forward for the North. Their conflict at the council meeting is a tense one, inflected by their vastly different experiences. At the Wall, Jon learned lessons about looking past one’s differences to embrace common ground, both with the wildlings and here with the houses whose leaders betrayed House Stark and joined Ramsay’s cause. In King’s Landing, Sansa learned about the perils of placing honor above political strategy, and sees this betrayal as an opportunity to send a message and reward those who are loyal. They both cite the memory of Ned Stark, but for Jon he is a beacon of honor and duty, whereas for Sansa he is—along with her brother Robb—a cautionary tale in bad decision-making. Although the North is no longer at risk of outright rebellion, comfortably held by the Starks and held together by supporters like the steadfast Lyanna Mormont (who still steals every scene she’s in), this rift between Jon and Sansa clarifies that the show has not sacrificed its complexity simply because major conflicts have been temporarily resolved. Their disagreement is inflected by their genders: although Jon shows a progressive approach to gender politics by asking the North to train their women for combat, he bristles at Sansa challenging his authority as his younger sister, and seems taken aback when she asserts herself by grabbing his arm to get his attention as they talk afterwards. Both have what I would consider good arguments: Sansa is absolutely right about her father and brother’s mistakes, but it was Robb’s overzealous punishment of the Karstarks that created their rebellion, and so Jon’s more merciful position regarding the families strikes me as suited to the situation. But with Littlefinger in Sansa’s head about her being the rightful Lady of Winterfell, there will be more of these discussions, and a far from simple road to building the proper defense against the invading forces. The central conflict in the North is that they don’t know what direction to look in: whereas all of the other armies fighting against the Lannisters are focused solely on that task, the North is caught between the two. And while Jon understands how to fight in the North, Sansa understands how to fight in the South, and it’s a compelling way of testing their respective leadership skills. There is a discussion of Cersei that makes Jon wonder if Sansa admires her, and throughout the episode Sophie Turner is definitely channeling Lena Headey a bit through her performance. Littlefinger may not have convinced Sansa to marry him, but he’s buried a seed, and I appreciate the way it generates internal strife within the Stark reunion. These are tense times, if not necessarily volatile ones. My favorite scene in the episode is Arya, riding from The Twins toward King’s Landing, stumbling across a group of soldiers. At first blush, the scene is an excuse for an Ed Sheeran cameo, as he sings a song of “hands of gold,” and shortly after it feels like it might be another spot of bother for Arya as she continues her quest for revenge, this large group of soldiers potentially meaning her harm. But the scene evolves into something even more disarming to Arya: an entirely normal moment of camaraderie among strangers. They offer her food and wine, and talk of their families and of the importance of home. Arya has spent so long dealing with matters of life and death that she has never really thought about the idea of home, or the lost future that would have been, with her at home at Winterfell caring for her aging father as one soldier imagines for himself. She eventually drops her guard, realizing that this isn’t a trap: it’s just soldiers, doing their jobs and helping out a stranger, and it’s a chance for Arya to feel human again after so long running away from her former life. It’s a beautiful little scene, and a glimpse of the struggles of self-identity she will continue to face as she tries to cross more names off her list. Arya had lost track of such values in her time in Braavos, much as Sandor Clegane lost track of them amidst his intense nihilism before his rebirth under Septon Ray. The return of the Brotherhood Without Banners is thematically consistent: after Jon’s resurrection, Beric Dondarrion carries new weight in this story, and it makes sense that Thoros and his flaming sword would lead the fight against the Icy enemy riding from beyond-the-Wall. 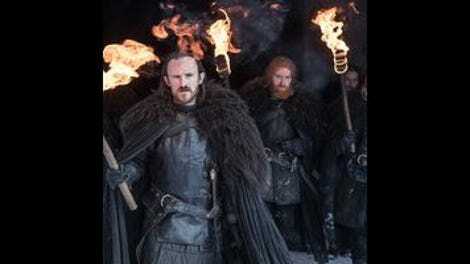 But while there is some basic exposition about what Thoros sees in his flames—the White Walkers marchers on Eastwatch-By-The-Sea, where Tormund is heading with the wildlings per Jon’s request—the story is mainly a chance for Sandor to address his past sins. In the snow, I didn’t immediately recognize the farmhouse where he and Arya stayed during their travels, and where Sandor stole the silver that the farmer and his daughter had intended to use to survive the winter. But when Sandor hesitates before entering and finds two skeletons inside, huddled together, the connection is abundantly clear. Sandor’s rebirth is a chance to atone for his sins, and so he buries the people he doomed—even if he was right they would have probably starved anyways—and takes one more step forward in his personal journey. And that’s what “Dragonstone” is invested in. While it spends a considerable amount of time sketching out the larger forces that will wage war for the Iron Throne or against the White Walkers, the relatively smaller ensemble—for this show, if not any other show in existence—left after last season is more intricately connected to that story. Sam is not off on his own journey in Oldtown: he’s Jon’s conduit to the history of Westeros, struggling through the grueling grunt work of training at the Citadel while sneaking books to get information—like the Dragonglass beneath Dragonstone—to send back to Winterfell. 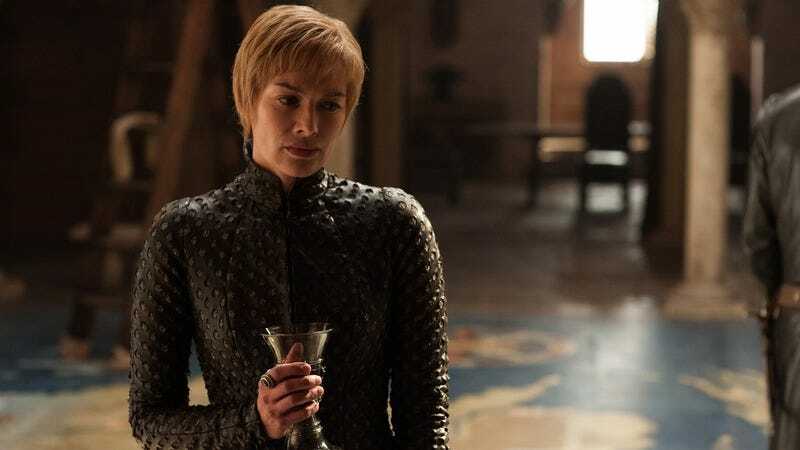 Characters like Euron Greyjoy that seemed like lone wolves last season are brought back closer into the fold, approaching Cersei with a marriage pact and then promising to bring her a gift to prove the honesty of his intentions when she refuses him. Even Jorah, whose whereabouts were completely unknown after he left Daenerys in search of a cure for greyscale, pops up in the cells at Oldtown, asking Sam whether the Dragon Queen has come to Westeros. And then she does. Daenerys’ return to Westeros is the series’ greatest delay: It is the central goal of the Targaryen siblings when we first meet them in the pilot, but Dany is taken on a circuitous journey of self-discovery. For so much of the series, she was off in her own world, only gradually connected to other stories by the arrival of other characters—Barristan, Tyrion, Varys—as the seasons wore on. Her return to Dragonstone is a transformative moment for this narrative, and it is treated as one by providing an entirely new perspective on the island fortress. When occupied by Stannis Baratheon, Dragonstone was rarely ever seen during the daytime, and I can’t remember ever getting a clear view of the castle and its surrounding landscape. My memories of Dragonstone are of shadows and dimly lit rooms, the dragons carved into the wall barely visible, and so it was almost as though we—like Daenerys—were seeing Dragonstone for the first time when she arrives on its shores with her small council as the sunlight showcases its carved beasts while her real ones fly overhead. Technically, no—we are now ending, officially and definitively, and within the next 12 episodes. “Dragonstone” does not rush to the finish line, and therefore does not deliver any large-scale action or the promise of much large-scale action to come in the immediate future. But this feels like the right kind of beginning for that ending, taking stock of the state of Westeros and allowing the conflicts to emerge not from sudden and rash declarations of war, but rather through the complexity of living in these distinctly trying times. The Archmaester tries to convince Sam that this is just another threat to the realm in a long list of threats, and that none of the past ones have truly brought the apocalypse some predicted: however, the whole point of this story is that this is no normal winter, and “Dragonstone” successfully makes clear that everyone but Jon Snow has a long way to go before they realize there is more at stake than the Iron Throne. In addition to new vantage points of Dragonstone that speak to the show’s increased budget, I can’t recall ever getting such a wide glimpse of Winterfell and its surrounding encampments as we get as Jon and Sansa speak on the parapets. Given the relevance of Winterfell’s isolation in their discussion, it was a nice reminder of the scale of the show’s geography, where no one alive is likely to march on Winterfell until winter has concluded. CleganeBowl Watch: I had honestly expected that we were going to get a reunion between the brothers Clegane sometime this season, but Gregor remains by Cersei’s side (threatening Euron when he gets too close during his royal audience) and Sandor appears to be marching north, not south, with the Brotherhood. I am not going to even attempt to discern the timelines of the various story threads, given the show itself has stopped attempting to, but it feels like Little Sam has grown exponentially, or that just might be my memory playing tricks between seasons. Some great sound work in the montage of Sam’s degrading duties at the Citadel—it’s a smart way to point out the doldrums of his employment that maybe goes on a bit too long, but it’s the sound design that elevates it and keeps it from seeming like a complete waste of time. I know that Arya is no longer a small child, but the idea that Maisie Williams would be as tall as David Bradley is a stretch for me, and the “Is height adjusted by Faceless Men faces?” question has never been answered as far as I am concerned. Although the books would suggest that Euron might be looking for a certain mystical object, I’m not convinced the show will bother with it, and might instead make Tyrion the gift in question given the stress Cersei places on their brother’s betrayal. How do we feel about New Euron? It’s a soft reboot of the character (same actor, different demeanor/costuming), as interviews foreshadowed with talk of revealing the character as a bit of a chameleon where the situation warrants. I appreciate the injection of humor, and it’s closer to his book character, even if his connection to Cersei ends up feeling arbitrary as opposed to substantial (especially given he is literally alone, with not a single other existing character at his side). Not sure how I feel about Jaime seemingly showing no moral resistance to Cersei’s actions: he raises the question of Tommen, but Cersei dismisses it quickly, and I still don’t have a handle on Jaime’s motivations outside of serving at Cersei’s side. What are his goals? What is his arc? That’s unclear to me right now, as in some ways King’s Landing now feels too empty after being arguably too full for much of the series. Tormund’s (Not) Got Game: We don’t actually hear what Tormund says to Brienne after sauntering up to her sparring with Podrick, but we see her storm off. Similar to Jaime, I don’t know what Brienne is doing except for being at Sansa’s side, which is something future episodes will need to address. Direwolf Watch: No sign of Ghost at Winterfell, and Arya remains a lone wolf roaming King’s Landing for the time being. Welcome, again, to our “Experts” coverage of Game Of Thrones. Thanks for joining us, and I hope that we’ll continue to have substantive, detailed, moving-too-fast, occasionally reductive conversations about the series as it continues its penultimate season. I’ll try to spend as much time in the comments as possible, but I know that the sheer scale of the discussion will make that challenging, so you can reach me on Twitter if you have any specific questions you want addressed or just want to hurl insults at me more directly.